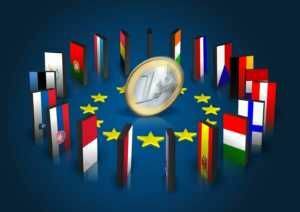 All European Union countries that adopted euro as their national currency form a geographical and economic region known as the Eurozone. The eurozone forms one of the largest economic regions in the world. Nineteen of the 28 countries in Europe use the euro as their national currencyForex Trading - How to Trade the Forex MarketForex trading allows users to capitalize on appreciation and depreciation of different currencies. Forex trading involves buying and selling currency pairs based on each currency's relative value to the other currency that makes up the pair. and hence, it is a common national currency for a group of countries together known as the Eurozone. The Eurosystem is the monetary authority of the eurozone. The European Central Bank (ECB)European Central BankThe European Central Bank (ECB) is the central bank for all the European Union (EU) member states. The body has the responsibility to the euro... exercises the sole power to set the monetary policyQuantitative EasingQuantitative easing (printing money) is used by the central bank to alleviate economic underperformance and keep the economy from falling into recession for the eurozone countries. The ECB is headed by a president and a board, comprising the heads of the central banks of the participating nations. One of the primary tasks of the ECB is to keep the inflation in eurozone countries under control. Local monetary situations in the individual countries can differ from the stance of the ECB, but eurozone members are prohibited from implementing individual monetary policies. For the enactment of economic reforms after the Global Financial Crisis of 2008, the eurozone established provisions for granting loans to its member states in times of emergency. With the aim of fiscal integration, it encourages peer review of national budgets of member countries. The ECB and the central banks of the EU states in the eurozone together decide the monetary policy of the union. The ECB exercises the sole authority to decide the printing and minting of euro notes and coins. It also decides the interest rate for the eurozone. Mario Draghi is the current president of the ECB. The usefulness of the euro increases due to its wider use across the member countries. The instability and uncertainty of nominal exchange rates are much lower, as a result of the single currency use. Hence, the costs of transaction and hedging are low. There is an increase in the trade and commerce in the intra-eurozone countries without any reported diversion of trade. Euro works as the vehicle-currency in international trade, thereby lowering the transaction costs of residents in the economic region. It also helps in simplifying the international policy cooperation. Financial integration across the nations are deeper. With the declining cost of equity capital and bond financing, financial integration may witness a boost. Greater price transparency encourages lesser market segmentation and discourages price discrimination. The ECB’s credibly brought down inflation in its member countries. Even during the fiscal crisis, following the launch of the euro, expectations of inflation were lower. The decline in interest rates translated into supporting growth and investment and lowering of public debt servicing. Stable prices are contributing to overall macroeconomic stability. The eurozone is almost resilient to shocks and external developments. However, the initial cost of adopting a new currency for all member nations, and the legal, administrative costs and changes, impose a huge cost. As member countries could no longer exercise direct control over monetary policy or exchange rates, it was implicit that eurozone members with wage rigidities and higher nominal prices would initially face frictional unemployment. It was expected to lead to short-term fluctuations in output and unemployment in those countries where the product and labor markets are less flexible. Real exchange rates changed after the launch of euro and hence, the burden of adjusting fell more on the deficit countries, because they were not able to devalue. The freedom of choice for the citizens became limited. Though some costs are accrued at the time of unification, benefits are reaped as the currency gains acceptance. There was a consolidation of economic governance as the financial integration deepened and the circulation of the currency widened. Time played an important role in shaping the fiscal fate of the eurozone. Despite using as a single currency, the eurozone is a heterogeneous mix of economies. For overall success, differences in institutions, financial structures, and legal systems must be eliminated. The massive concentration of power at the top with the decision-making authority poses a threat to the individual liberty of the member nations. However, it cannot be denied that the use of a common currency facilitates the exchange, specialization, and integration of national markets into a wider market. It also significantly reduces the costs of transaction induced by currency risk and increases benefits from international trade.